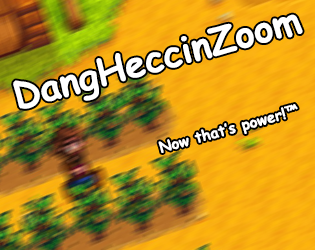 Have you ever wanted to just zoom around the map in Stardew Valley? Tired of painfully slow "running"? Well then this mod is for you! It's super simple, just install it like any other SMAPI mod and hold down space to run around at the speed of sound! You'll be the envy of all your friends without a doubt. This mod was created as a learning exercise and is by no means meant to be balanced or fair. I may change values in the future or add features to make it more balanced or interesting, but as it stands now this is it's final state. The source code of this mod is free to use for whatever you wish and can be found here. This mod is installed just like any other SMAPI mod in Stardew Valley. If you don't know what SMAPI is, you can get started here.